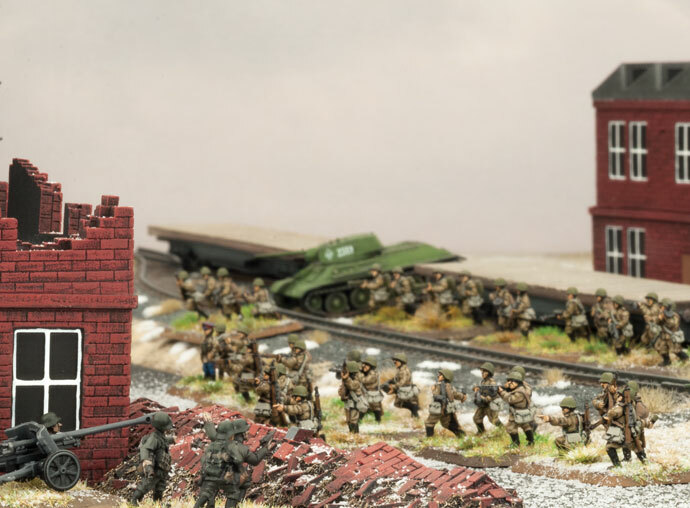 The seven-month fight for Stalingrad is a favourite for wargamers and military historians alike. It is a crucible, a meat grinder and a bloody struggle that birthed a new era of vulnerability for the Germans and the generation of urban warfare tactics built with the blood of both sides. For the soldiers that could survive and learn there was the promise of another day fighting and living, but also the chance to pass on how they survived to other troops. The fighting in Stalingrad exposed the gross ammunition needs of two forces in urban conflict, with the troops requiring an secure supply of arms to have a hope of repulsing the enemy and digging them out of their ratholes. When you translate these fierce accounts into a game of Flames of War you can imagine the troops festooned with ammo in belts, clips or drums and grenades sticking out of every pocket, sharpened shovel wedged in their belt. 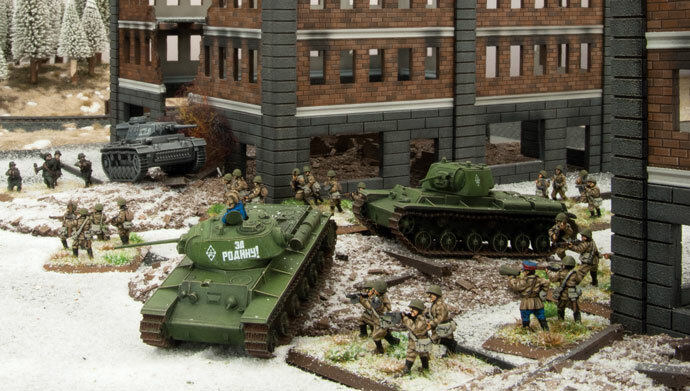 The Soviet emphasis on assault groups combining brave SMG wielding breaching troops, crew served support weapons such as HMGs, 50mm mortars, PTRD anti-tank rifles and the fearsome ROKS Flamethrower. This orchestra of firepower ensured there was an absolute storm to keep the enemy’s heads down, rout them from their hiding holes and then reinforce and defend the strongpoint, while planning the next leap out of cover. Once the plan for the counterattack around Stalingrad was being built up, the Soviet strategy in the fiercely contested city was to build interconnected and mutually supporting strongholds, so that attackers would get no respite after one was taken and would have to battle through intense fire to take a whole section of the line, or try to penetrate through to an objective. This is a reinforced Heavy Infantry assault force of well-equipped and resourceful fighters keen to force back the fascist beasts and retake their Motherland, one street and ruined building at a time. With the Scouts leading the attack you can cover no-mans land faster and get into a good place to hose down the defenders before assaulting them from their positions. 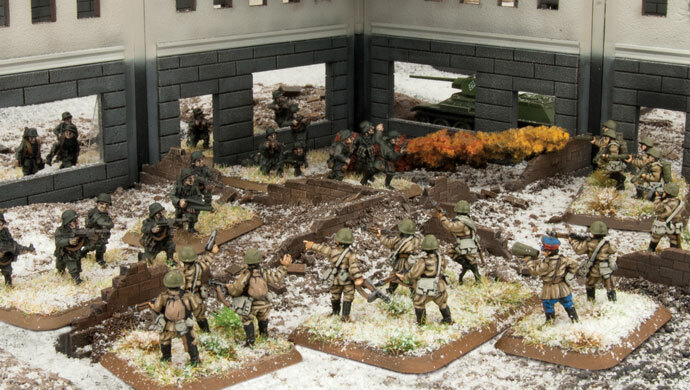 Focus the supporting fire from your Hero Rifle & Storm heavy weapons and bombardment from mortars on teams with high ROF to give your Scouts & Storm Group a solid chance to get into an assault with their shovels and deadly SMGs. Always remember that the Storm & Scout Units are to be treated like Veterans, they are not massive units to be worn out for limited gains. They are elite units that need to be used with cunning and finesse. Although they do survive crossing open ground much better than Aggressive troops, it would be best that you conserve their numbers until needed. Let your Hero Rifles take the heat of the advance, then launch your frontovik’s at the enemy’s throats. The Storm Group has many heavy weapon teams which you may want to keep alive for their firepower, but you also only have so many SMG teams to get stuck into an Assault, so balance your casualties to the opposing force. For example, PTRD’s would be the first to go if you face Infantry, but keep them around if the enemy has light armour that threatens you with MGs, especially if they would be brought into an enemy Defensive Fire radius. If you arent going to be Assaulting during a turn, make use of the ‘Blitz’ special order to get ahead on the battlefield as you need to make use of your firepower, but also keep the Heavy Weapons close to your SMG teams so can’t spread out too much. If you really need to get an Assault in, have the rest of your force Pin down the enemy strongpoint, then do ‘Follow Me’ to get your SMG teams as close as possible to their chosen target for the assault. Note for newbies: make sure you have them facing the right way to be in the right place for the Assault, as the ‘Follow Me’ order moves them directly forward! The Red Army can provide you with excellent armoured Units to reinforce your push on the enemy objectives or stabilise your defensive front. The KV-1 is the heaviest tank on the battlefield and is monstrously large compared to the puny German mediums, it is incredibly resilient versus anti-tank fire and a beast in Assaults. To help your Infantry advance across the battlefield or shift their defensive lines they need to be covered from enemy Machine-guns, especially mobile ones that can hold your forces in place with threat alone. T-60s and their 20mm cannon are a great deterrent for opposing enemy light armour, they are cheap and cheerful in the old style of ‘mobile armoured suits’, with just enough mobility, armour and firepower to be useful. They also put out a lot of MG shots, so useful to secure a necessary Pin on enemy troops so you can get an Assault in. Being less than one point, each also makes them a great fit for working with Heavy Armour and your elite Hero and Storm Group units. First thing you must add is a Heavy Tank Killer Company of 4 x ZIS-2 AT guns, with the top reason being they are a great ambush to catch any expensive enemy Panzers trying to threaten your line with dangerous AT11 shots. The Enemy at the Gates book brings back this personal favourite of mine and gives them an extra boost of experience and skill to add into the FoW V4 benefit of a 3+ Gun Save. These are now rated as elite troops, with a Careful 4+ ‘Is Hit On’ and Skill of Veteran (base 3+ Skill check), this helps push their survivability and deadliness up even higher. They remain mobile with a Tactical of 4” and Cross of 3+, so can adjust position to defend against threats or opportunities. Combine your growing line of guns with a 76mm Artillery Battery of 4 x ZIS-3 guns. This brings another solid Firepower 4+ bombardment which also reinforces your defensive Direct fire AT gun-line with the old Soviet reliable of 2 AT9 shots with excellent 3+ Firepower. 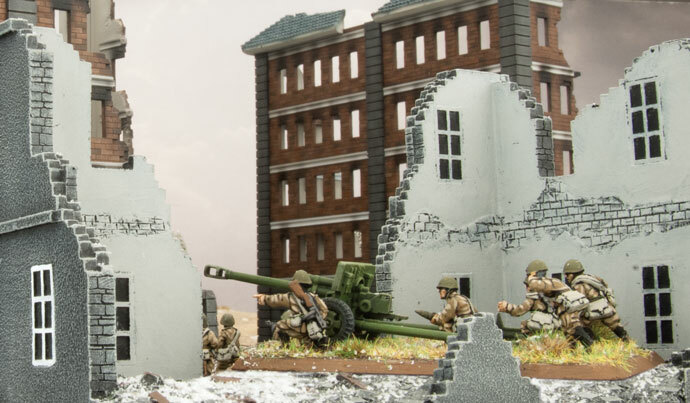 Remember they are still great on the move, but have large bases as they are Heavy Guns and once set in place you want to conserve their movement and focus on blowing up the enemy. The last Unit to bring to the table is the glorious Il-2 Sturmovik Assault Company, with 2 x Il-2 Sturmovik planes to zip around the table and strafe enemy light vehicles or Infantry in the open or add to your AT firepower with a combined bombardment of RS-132 rockets, FAB-100 bombs, and PTAB anti-tank bomblets. Looking back to your core Infantry force, those Scouts could use a few more men to help them “catch tongues”, so add in 2 stands for a few points. Then round out the last point of your 100 with the excellent “Lucky” Command card to keep your opponent on their toes and having to try extra hard to keep you away from your objectives. 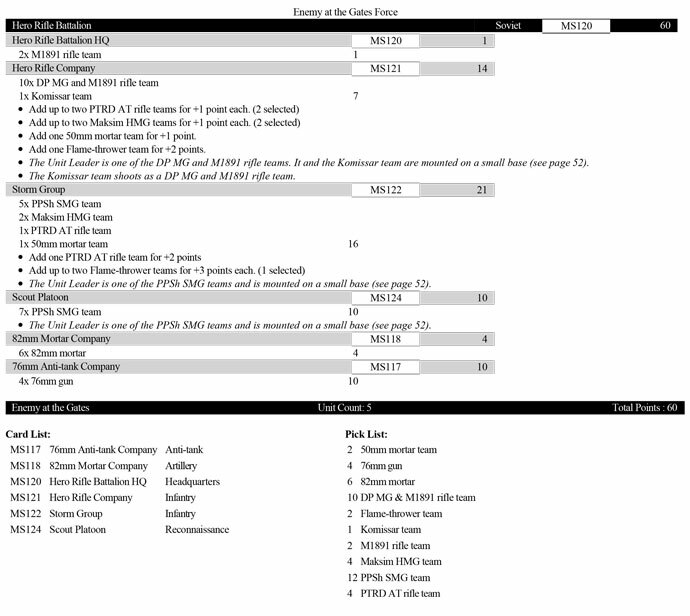 Add in a T-34 Tank Company of 7 x T-34. This provides you with another threat versus enemy armour as well as a very mobile and strong reserve to either exploit a flank or aid the resistance at the enemy’s main focus point. 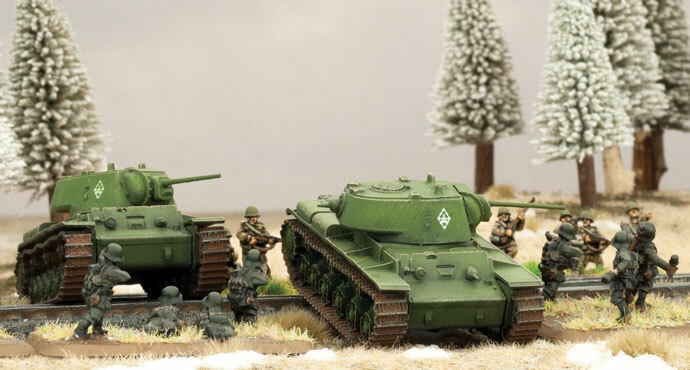 The excellent all rounder T-34 can threaten light and medium tanks by itself and also keep Infantry & Guns in check with Firepower 3+ for the 76mm gun and 4 MG dice (they have Coax & Hull MGs). These tanks can take on opposing light and medium armour in glorious fashion, with a decent AT9 able to challenge most Panzers. Versus heavier forces the T-34 can use their speed of 12” and weight of numbers to threaten flanks and hold the enemy back. With the only penalty for movement being Overworked on the main guns, you can shift some of your tanks without influencing other tanks in the same company. So in summary the Hero Rifle Battalion backed up by an elite Storm Group provides you with a hard-fighting no-nonsense force that still packs a lot of stands, firepower, shovels and can attack or defend against a multitude of different enemy forces. You get a lot of flexibility with your choices depending on the mission, table and opposing force, so make the most of your enemy’s weaknesses.